When it comes to potty training and usage, BABYBJORN Potty Chair makes everything simple and comfortable for your child.it simply helps your child’s graduation from the diaper stage easily. BABYBJORN potty chair is the most ideal for those occasions that your child wants to take more time sitting on the potty. The smooth edge in addition to its sturdiness ensures the child gets maximum comfort. The high backrest and the armrests means that your child can simply sit back and relax while using the potty. The inner potty which is removable can be emptied easily and be cleaned. Simply lift it out by using the convenient handle found under the splashguard. Thereafter empty the potty and wipe it clean or rinse it under running water. The design comes with no edges and grooves and smooth plastic used to make it helps to prevent dirt from building up. It has a smart design -the edges are rounded and smooth and therefore your child won’t experience skin pinching. The leg room is also plenty which means that a child can easily sit down or stand up. It’s a BPA- free plastic. The BABYBJORN potty chair meets the plastic safety standards in USA and Europe i.e. the plastics used to make the potty chair are rigorously and continuously being tested for BPA (bisphenol A) and other high risk substances that can be hazardous to health. The plastic used to make BABYBJORN potty chair is even certified safe for food. It also comes with a splashguard that helps to prevent spills. The use of BABYBJORN Potty Chair is not recommended to children of specific age as the age for potty training normally varies from child to child and therefore BABYBJORN Potty Chair can be used you’re sure your child is ready. 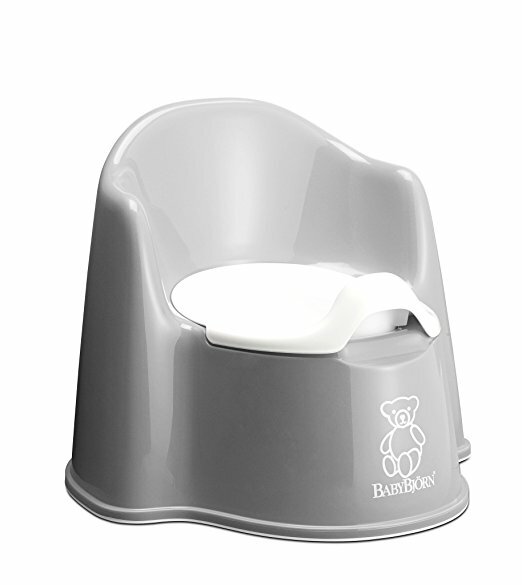 BABYBJORN Potty Chair is made from thermoplastic elastomer (TPE) and Polypropylene (PP). It weighs 900 g, and 36 X 35 X31.5 CM in terms of measurements. Parents who have bought the BABYBJORN Potty Chair for their children are satisfied by the product. The Potty’s simplicity is award winning. It completely mimics the real toilet thanks to its beautiful white finish along with the backrest support. The rubber grip at the bottom means the potty won’t slip around while your child is using it therefore their safety is guaranteed. At only 900 g, it’s a lightweight, but also big, bold, very simple and yet still modern. The material used to make it is durable and your child is guaranteed use until they outgrow it. The Potties also come in various colors such as Grey, Blue, Green, Pink, Turquoise, and Orange and White therefore you have a color range to select from. With BABYBJORN Potty Chair, potty training is made easier.